The diffusion of hydrogen in austenite is slower than in ferrite. Experiments have been conducted to study the behaviour of hydrogen in a nanostructured steel sample consisting of a mixture of thin plates of bainitic ferrite and intervening films of retained austenite, with the latter phase present in a quantity larger than the percolation threshold, i.e, it has three-dimensional connectivity. The structure was then heat treated to control the fraction of austenite, and hence to study the role of hydrogen when the austenite decomposes below the value required to sustain percolation. The experiments have involved both thermal desorption analysis and permeation, and when combined with theoretical analysis, indicate a significant influence of percolating austenite in hindering the passage of hydrogen into the steel during hydrogen charging, and its permeation through the composite nanostructure. The effect is not as large as might be expected from a simple comparison of independent data on the diffusivities of hydrogen in the two lattices, because the effective diffusivity in ferrite is found to be much smaller than in the defect-free ferrite, due to trapping effects. 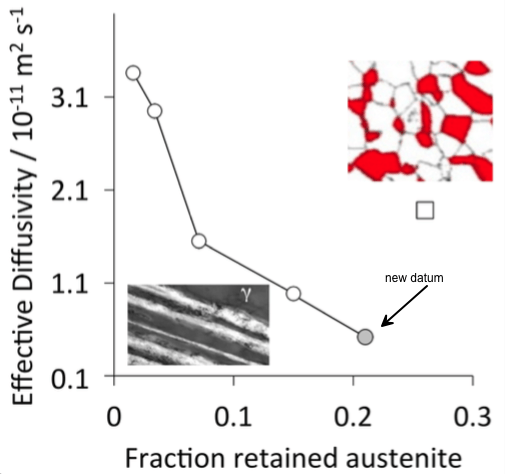 The morphology of the austenite is demonstrated to play a role by comparing with a sample containing a larger volume fraction of austenite but present as isolated grains which are ineffective to the permeation of hydrogen. Proceedings of the Royal Society A 470 (2014) 20140108. Kazum et al. have published a paper entitled Hydrogen Permeation in Nanostructured Bainitic Steel, DOI: 10.1007/s11661-016-3677-2. In this, they report an effective diffusion coefficient for hydrogen in nanostructured bainite. Their single point is plotted as a filled circle in the figure below, which shows that the new datum is remarkably consistent with our original data.